Cool people doing amazing things — and I get to write about them! You are a runner in a relay race. As your teammate approaches you, you see her hand extend, holding the baton. Your feet move to keep pace as she draws nearer. The fingers in your hands blossom out, creating a target, not just for the baton, but also for the responsibility, the confidence, the weight of the entire collective. You are the runner; you are the next editor-in-chief of the Other Press. The sprint is a year long and starts in September. Douglas College gathers for orientation, and the parking-lot-like building that is the New Westminster campus fills up with young minds. Sitting at a foldout table in the concourse is an optimistic individual, driven to make a mark on the long legacy that is the Douglas College newspaper: the Other Press. With a welcoming smile, the editor-in-chief of the only student newspaper on campus showcases the publication to new students entering the post secondary institution and sometimes to students who have been enrolled in the college for years already. During the length of the orientation, the editor-in-chief is not only present to increase readership, but also to recruit contributors by introducing the variety of roles that goes into running a publication: writers, designers, illustrators, photographers, distributors, etc. The editor-in-chief is not only the boss, but also the ambassador. The Other Press, like a collegial program, is a revolving door for students to collaborate and gain experience in preparation for the real world. Each year, the editor-in-chief position opens up. The incumbent can choose to reapply and serve another term, or choose to leave the shoes for someone else to fill. While much of it feels like training for the job of the future, being the leader of a student newspaper is a responsibility that weighs heavy, especially when working with a group of unseasoned writers, editors, and contributors. With ego and inexperience colliding, it is the job of the editor-in-chief to both calm the waters and steer the ship. Hidden away on the first floor is the Other Press headquarters in Room 1020. During the Fall and Winter semesters, the collective gathers weekly in the bowels of the campus to produce a newspaper. The issues will sit on black metal stands at entrances and high traffic areas of the school, but with only 50 per cent pick up—roughly 500 hundred hard copy readers per week—it often seems like a job that is supplying without demand. Without a need to feed the beast, it’s easy to become apathetic. The editor-in-chief term at the Other Press is indeed a marathon, but the leader is not running alone. Leading a team and keeping them from falling into the grips of apathy is as challenging as keeping up with all the emails that pile up. The job is not just about meeting deadlines; it’s about producing quality work. The Other Press began in 1976 and it has always struggled to find its place within the Douglas College ecosystem. Splintered from the rest of the institution, the Other Press requires the editor-in-chief to bridge the gap between the different societies and communities, while staying true to the publication’s journalistic values. The Other Press is an organization with many moving parts. It’s often hard to keep track of the squeaky wheels. In an effort to produce a newspaper on a weekly basis, there are going to be mistakes. The lesson is in how one recovers. Consider all the errors that take place in a classroom: spelling mistakes, incorrect facts, plagiarisms, etc. All these problems are magnified when it is printed a thousand times and handed out to the general public. The editor-in-chief’s face is on every issue printed. If there is a problem, there is no hiding and there is no blaming; he or she must face the hard light. It was a funny time indeed. A humour article mistaken as legitimate news got the Other Press in hot water at the tail end of 2013. Gibb was the editor-in-chief at the time and he received the brunt of the backlash as the article involved the New Westminster Police Department. At the time, it was no laughing matter for the publication. But Gibb laughs it off now, reminding us that the words printed on the paper have impact. Being the leader of a media organization, even one as small as the Other Press, carries a certain responsibility. It’s not just for the people who speak out, but for the people who don’t as well. Each week, the editor-in-chief of the Other Press chases the clock, rallying the collective to produce a high-quality publication for the readers. It doesn’t matter if it’s the first few steps in September or the last leg in August, they know their efforts will be visible in print and digital not just for Douglas College to see, but for the whole world. They also know that their time is fleeting. This learning experience they treated wholeheartedly as a “real job” will soon be over. You are a runner in a relay race. You receive the baton—but it’s not really a baton, it’s a fire extinguisher. You are the next editor-in-chief of the Other Press. You want to make your mark, but it’s actually an environment to make mistakes. If that’s the case, the best mark is to continue the legacy, improve the organization incrementally for the next generation, and allow room for the leaders of the future to solve the problems that are as ingrained into the institution as student apathy. For over 40 years, the Other Press has been a fixture in the Douglas campus community. While it might be considered fringe, because there are no academic programs linked to it, it a necessary part of the institution. The craft of writing, editing, and communicating is a key to professional success, regardless of the student’s career path. Why does a school have gym? Not because we want our students to become body builders or professional athletes, it’s because we want them to establish a healthy lifestyle. The same goes with a student newspaper. It’s not about the product; it’s about the work itself, and it’s about getting better and stronger at the craft. For the editor-in-chief, it’s his or her chance to learn what no course in Douglas can teach, and that is a unique opportunity. For the longest time, team sports have had reputations as being poorly organized. It was not because the coaches were incompetent or because the players were disorganized; it was because there was a lack of easy-to-use tools. In addition, the market for communication, management, and scheduling apps is as crowded as a defensive zone in the fourth quarter. TeamSnap, an application designated for teams and clubs management, has a simple philosophy to break away: elite customer service and great user experience. Team communication is paramount, whether it’s on the field, on the rink, or even on the way to practice. People need to know where to be, when to get there, and what to bring before they can score goals, make saves, and win big. It’s not uncommon for venue and game time to change last minute. There isn’t always time to inform every person individually, and mass messaging on certain platforms will be neglected because the player or participant is already on the road. Most of us understand the pain and hassle of organizing an event. Most of us also know the headache when a certain aspect falls through. 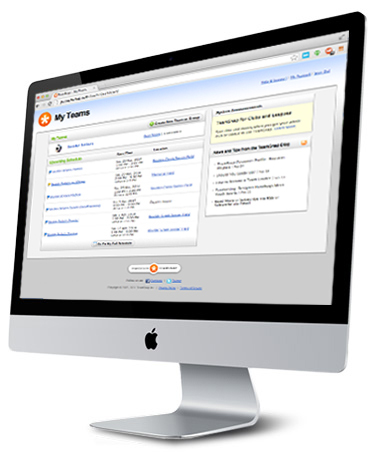 But with TeamSnap, all the organizer or coach has to do is change—for example—the time of the event on the TeamSnap calendar and every member will be informed in the manner they desire. With over seven million users and an infrastructure that informs people, TeamSnap is taking it to the next level by broadcasting in-game experiences. Chat, scores, and highlights can all be crowd sourced during the game. Everybody on the sidelines can contribute and offer an experience for those who aren’t there. Unlike Twitter, TeamSnap is a private social network. Only those accepted by the team’s inner circle will be able to receive updates, stats, and conversations. While the experience on TeamSnap is familiar across the board, different sports require different approaches for a fine-tuned experience. Every game and every league has little subtleties and TeamSnap accommodates by allowing organizers to modify templates. Having hit critical mass in such markets as Vancouver (2,200 teams and the third largest in Canada), TeamSnap is aiming to add more value to the users involved by providing goods and services related to sports. The data stored in TeamSnap, such as experience level, type of sport, and start of season, can all be utilized by brands to offer products and services that fit the players and the teams’ needs. A coach can inform a brand of the team colour, and in return the brand can recommend shoes and jerseys of that colour for the players. by Elliot Chan on Jan 2, 2015 | Originally published in Techvibes. By now we have all seen a commercial 3D printer in action, spitting out filaments layer by layer until it replicates a predetermined design. The technology is stunning, but conventional usage of 3D printers has been limiting for two specific reasons: technology and design. Sure, we can all use more trinkets, knick-knacks and miniature models, but there must be a way to add value to the printers. Perhaps one day we’ll have 3D printer sets in our home, an appliance placed beside the microwave, blender and television. Kingston, Ontario-based, Mosaic Manufacturing is not a company that builds 3D printers but a company that is making 3D printers better, more practical and with a greater purpose. By introducing multi-material and multi-colour filaments into the printing process, Mosaic is able to create working products such as a flashlight. For the time being, electric devices require certain parts and assembly. The capacity to add several materials into the 3D printing process will enable the industry to print goods in a cost-saving manner. Imagine a world where we can print a remote control when we lose it. The old solution, should you want to print a multi-colour or multi-material product, is to have two printer heads performing different tasks (example: one would distribute the colour red and the other one would distribute blue). The problem with this process is that—like a hot glue gun—when you stop using it, the material will ooze and drip. 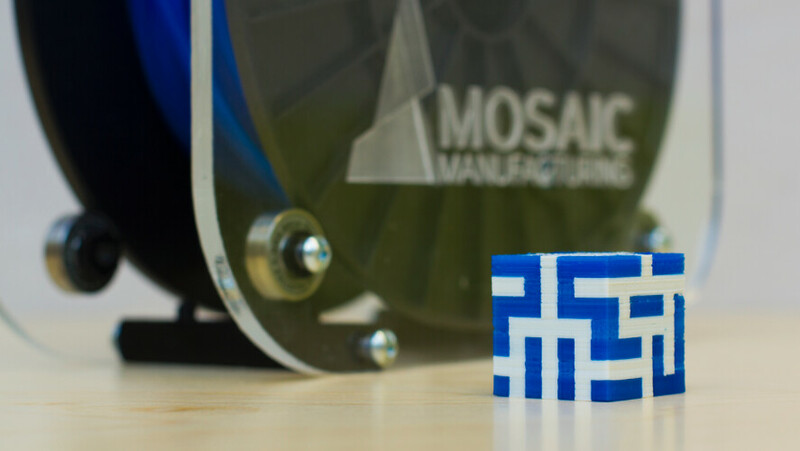 The Mosaic Manufacturing solution takes materials with different properties and combines it into a single filament so that it extrudes from a single printer. Using Mosaic’s unique software, the program is able to analyze the design model and determine what material is needed in what order. The number of use cases for 3D printer will depend on the person using it, but as the technology and design outlets improve, we may find it to be the convenient and feasible solution. A kilogram of filament is currently priced at approximately $35. With a kilogram, you can print a lot of things (example: a phone case may cost you $20-$30, if you print it, it’ll cost you 50 cents). Coding is a universal language; however, many find it daunting, confusing, or overwhelming. Like learning all new languages, the best way to become skilled is to engage with it socially. That is the environment The HTML500, a free one-day coding event hosted by Lighthouse Labs, has established. The HTML500 will kick off 2015 in four Canadian cities: Vancouver (January 24), Calgary (January 31), London (February 7) and Toronto (February 22). The value of coding stems further than getting a well-paying job (Canadian programmers can make over $50,000 annually), it can also give people the confidence to create projects that change the way we live. Although coding is often recognized as a young person’s game, the best coders are those who are curious about technology and strive for logical solution-oriented thinking. The 2014 The HTML500 welcomed attendees ranging from 13 to 65 years old. For many years, those who were interested in coding had to seek educational workshops and tutorials independently through online sources such as YouTube or apply to post secondary programs and private institutions. Few classes in elementary, middle and high school deal with the in-demand skill set in depth. Students will rather stumble into it or take initiative if they want to pursue programming and tech. With numerous job opportunities in mind, The HTML500 encourages attendees to bring along their résumés. After the event in 2014, the organizers discovered that many companies were interested in hiring people for non-technical roles. This year, The HTML500 has partnered with Vancouver Economic Commission to host a career fair at all four events. Companies participating range from startups to corporate companies, including some establish brands such as Techvibes Job Board regulars Hootsuite and Unbounce. A one-day event is obviously not enough to tech everything about coding, but The HTML500 is hoping to give the attendees some comfort and confidence, in addition to creating a community for developers of all level. Originally published in Techvibes Media. From high-intensity training to grocery shopping, Strongbody Apparel is ready to face any challenge. The Vancouver-based athletic wear manufacturer is changing the way people think and wear their gym clothes. Gone are the days of jogging in a worn out hoodie á la Rocky Balboa: casual and professional athletes alike are seeking the next garment innovation that can endure the strain and sweat of training, as well as the functionality needed in order to reach their athletic pursuits. Strongbody Apparel spent almost three years researching and developing fabrics that can satisfy the fitness-driven public of tomorrow. The result is a product that combines enhanced functionality of active wear with sophistication of high-end fashion. Their unmatched innovative fabrics is suited with antibacterial nanotechnology—Chitosan, harnessed from crab and shrimp shells—that enables the garment to stay fresh over time, workout after workout, wash after wash, gym bag after gym bag. There was a time when athletic wear in public was looked upon with the same distaste as those walking down the street in their pajamas. Now with a more active attitude towards fashion, wearing sporty apparel to run errands is the comfortable norm. Strongbody Apparel is reaching out to the market that grew up with athletic clothing and delivering a sense of practicality. Strongbody Apparel wants to be seen in a different light from those over-branded, neon coloured activewear seen on the racks of department stores. It doesn’t want to be another “knock-off” product. While big name brands have worked to build a slogan-spewing culture, Strongbody Apparel focused on innovation: breathable and moisture wicking, wrinkle and pill free fabrics, and zoned ventilation construction to name a few, earning the people’s trust in activewear back. Strongbody Apparel’s Kickstarter ends on December 4 and it has earned approximately $20,000, after achieving its goal with 24 days left. Originally published on Techvibes Media. “The world is drowning in imagery,” says Shashi Kant. Netra Systems is a visual search and tracking company designed to clean up the way we access our overwhelmingly large quantity of video and image-based content. Not just in our Instagram, Flickr and Facebook, but Netra Systems is hoping to alleviate the strain in numerous other sectors including retail, healthcare and security. Netra Systems apply both machine-vision technology and a search engine style indexing. The algorithm breaks down a video by frames and tracks the blobs, which are the distinct objects within the frames. From there, Netra Systems identify the visual attributes of the blobs—should it be a vehicle, a cat, a human, etc.—it’ll note the colour, contour, texture, shape, etc. Once the program recognizes the appearance characteristics of each object, it’ll give it a label in accordance to the most similar appearance. The “deep learning” will, for example, identify that within the image there is a blob that appears to be a cat, thus marking it as such. Then like Google, should a user search “cat” in the database, a list of plausible images will be presented in a search engine style result. The capability of identifying imagery through an artificial neural network has a lot of potential for organization that focuses on little details. In recent scenarios as examples, Kant brought us back to the tragic events of the 2014 shooting at Parliament Hill, as well as the horrific incident involving the aftermath of the Boston Marathon bombing. Organizations of all sizes invest a lot in cameras and machine vision, not only for security but also for visual data such as understanding high traffic areas within a store. By having a keen eye on a promotional item, retailers and suppliers can analyze customer’s engagement and propensity. The knowledge acquired will help merchants, managers and executives work together to make the best out of their retail space and the merchandise within. No doubt the visceral reaction to visual data is unlikely to change soon, however, we can clearly say that new technology and governance are being applied to keep us blobs safe when we are on the screen. Netra Systems offer a unique privacy protection that obfuscates images identified as humans in real-time. The original video will be recorded, saved, and retrieved only by those authorized, i.e. law officials. “Plus the fact they are just damn smart,” he added. Netra Systems is currently piloted and used by a number of major retailers and media and advertising agencies. Nothing says teamwork better than a group of people aligned in the decision making process. While some workplaces are guided by the “executive decisions” of the boss, that leadership practice might not necessary be the best approach in advocating change, nurturing involvement and learning from prior mistakes (i.e. bad decisions). Steven Forth, CEO and director of Nugg, an application that enable workplace team members to focus, decide, track and align ideas, believes that decisions should not be made in a vacuum, and that the full decision-making cycle begins and ends with proper communication. The decision making cycle includes five key steps: surface, discuss, decide, execute, and review; all of which plays into a long-term goal. It’s true that not all decisions are of equal value; some are undoubtedly more serious than others. With that being said, the process of making decisions should not feel random, even though gut feelings, deadlines and stress may play a role. By establishing a workplace culture that track, measure and review decisions after time have passed, allows team members to stay alert and execute appropriately in the future. Setting deadlines may seem like a stress magnifier, but that is not necessarily true. Implementing deadlines can sharpen intuitive decision-making, dampen procrastination and offer a more focused timeframe for exploration. It’s not surprising that most people would want to quickly dismiss a bad decision from the past, wipe it from their mind and start anew. But that mentality will lead to history repeating itself. Don’t simply brush bad results under the desk, because they’ll likely reemerge in another form to waste time, effort and money. On the flip side of the coin, good ideas are exchanged on the daily with zero trace. These ideas are often lost in an email thread, scattered amongst the shambles on your desk or simply placed in the back of your mind. Making decisions, especially on behalf of a whole company, is a scary venture. Ultimately, most long-term results are unpredictable. That being the case, an individual may panic, second-guess or be guided by a bias intention. Even the most apt leaders will have trouble making those “executive decisions,” but the pressure shouldn’t fall solely on the boss—the supporting team should have equal responsibility to supply input and review previous cases, thus leading the best possible result, even if the decision was made in haste. In a global economy where everyone and everything is here and there, Vancouver-based Control places the control back into the hands of the business managers with mobile payment access and upgraded analytic tools. Bitcoin, Dwolla, Apply Pay and credit card processors such as Stripe and Paymill have changed the way businesses operate. And as many as 70% of those finance managing companies have chosen an open protocol, which when integrated with Control will offer their users a more diverse payment managing experience. HootSuite capitalized on their success because they were able to build business applications on top of the Twitter API. At one point, Facebook tried to purchase the social media management dashboard and make them the primary dashboard for Facebook, but Hootsuite declined the offer, knowing that the bigger opportunity comes by connecting to every platform. Control is doing what Hootsuite did for content developers, social media coordinators, etc. and is applying that model to payment stacks for businesses. And like Hootsuite, Control is “platform agnostic,” which is one of the reasons why they have integrated so well with numerous online payment companies such as Stripe. Stripe’s easy merchant onboarding makes it simple for users to sign up and for businesses to freely access their API. It was Stripe’s push toward this open API model that shifted the momentum of the industry. Even PayPal—a traditionally closed platform—who’ve spent many years enjoying their monopoly are now participating in this open-data economy. Moreover, the high demand for quality analytic tools adds another valued element to Control. The same way Hootsuite built better analytics than Twitter, Control refined that aspect for payment platforms. Although any merchant or business manager can benefit from Control, the most prevalent users are those that run a SAAS, online or global business, which requires the business managers to be somewhat like “modern nomads.” The ability to manage transaction activities directly from the mobile app, while they are on the go, will ease workflow, improve customer service and be more vigilant against fraud through mobile payment. Control’s iOS and Android apps are now integrated with Stripe, in addition to being the first Paymill app in Europe. Currently Control is building the control board for the web-based analytics and preparing to launch beta within the next month. By the end of the 2014 Control will go live anywhere Stripe is available as well as targeting the 9 million PayPal merchants across the globe. Originally published by Techvibes Media. Vancouver-based Unravel recognizes that in our content-heavy world, consumers are often bombarded with irrelevant content—content that has imminent expiration or is calling to an improbable action. These types of engagement are fruitless for the brands and businesses and are annoying for everyone. The old paradigm is that it was up to the brand to attract and nurture the consumers by reaching as far and wide as possible, but Unravel is enabling the consumers to meet the content and data halfway. By using iBeacon technology developed by Estimote, Unravel is creating a new avenue for companies to communicate with the public. People with the Unravel app on their smartphone can one day walk up to a restaurant and instantly see the menu or approach a movie poster and get the nearest theatre location and show time. Once the individual “Beacons” are implemented in a given service location, it will be capable of functioning in three different zones: Immediate (one meter), intermediate (five meters) and very far (25 meters). Unravel is not only using the iBeacon to send messages and entice customers, there is a lot of big data that can come from such a little device. The iBeacon can measure temperature and evaluate the number of occupancies in one area for a length of time. All this data can be instrumental for companies such as transportation, retail and event hosting that are seeking optimal costumer services and internal performance. Currently Unravel is preparing to host a series of scavenger hunts in collaboration with established businesses. Participants will get to experience the new technology first hand and have a chance to win gift cards and event tickets. The app will be available shortly on the App Store and the scavenger hunt is set to commence in August. Unravel offers brands and advertisers a broad platform to inform, promote and keep in touch with consumers. The scavenger hunt is the initial step for Unravel to gain traction, but the potential seems promising for this young company as they continue to educate the newfound value of iBeacon. Previously published in Techvibes Media. Earlier this month, the popular online portfolio platform 4ormat underwent a rebranding and relaunch. Since 2010, Toronto-based 4ormat—now Format—has been the choice for tens of thousands of creative professionals across 125 countries. Showcasing work is a vital part of every creative’s business and life, so the platform becomes an extension of what the person does. Like a suit for a businessman, the webpage needs to look good and feel good. Many web-building applications have immerged on the scene since then, and users are beginning to identify new demands: mobile flexibility; fluid, clean and speedy presentation and enhanced managing features. Format, of course, is all about accommodating those needs. Still Format stresses the importance of customizability and simplicity, understanding that most photographers, illustrators, painters and artists aren’t fully capable of designing, building and managing a website without a little handrail to guide them. Format prizes itself by having a shallow learning curve and an easy to grasp usability. Users begin by selecting a theme, a style in which the work will be displayed. It could be a slideshow, an album of thumbnails or an interactive scrolling feature. Included in the interface is the theme editor, a feature that enables users to fine-tune detailed elements of the portfolio. Not only is the background and colour customizable, but also the size of images, how visitors interact with the content and what the padding, spacing, etc. looks like when published. And all that is accessed through a simple drag-and-drop design that makes adding and modifying works quick and easy. So how does Format balance the demand for more customizable features and the straightforwardness of the application? That is a question the team at Format ask each other, and that is the fine line the design-oriented company walks on a daily bases. Artists are known to experiment and try new things, and Format is taking some inspiration from their users. The platform’s relaunch, coinciding with the rebranding and redesign, is a wonderful reminder of what artist, entrepreneurs and designers can do when they all work together to present truly moving works and create new standards across all industries.